Burfict returns however S Reggie Nelson has moved on. The last time we looked in on the AFC North, the Pittsburgh Steelers were embroiled in an epic playoff battle with the Cincinnati Bengals when the unexpected happened… Vontaze Burfict sealed what looked like the first playoff win of the Marvin Lewis era. Then a Jeremy Hill fumble while trying to run out the clock opened the door, and a few senseless defensive penalties allowed the Steelers to steal an 18-16 win. These two antagonists renew acquaintances in week 2 in Pittsburgh and a few questions arise. Will the Steelers be able to move the ball on the ground with LeVeon Bell serving a 3 game suspension?? 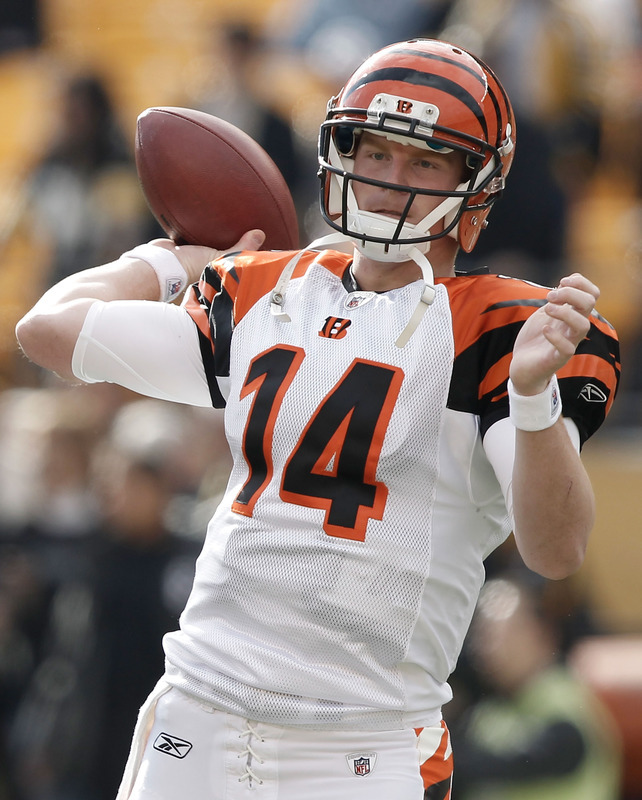 Can QB Andy Dalton get that signature win vs. a top AFC contender?? Have the Bengals learned from last year’s meltdown in January?? Cincinnati has a tough beginning to their season with 4 of 6 on the road which includes trips to Pittsburgh in week 2, and to New England in week 6. How New England fares during Brady’s 4 game suspension dictates how desperate the Patriots could be for a win. Typically these are the games Andy Dalton always seems to lose. Will 2016 be different? Speaking of suspensions, the Steelers will be without LeVeon Bell for the first 3 weeks of the season. The only AFC team they play in that stretch will be against the Bengals. So they have time to catch Cincinnati with a slow start. They’ll have to run the ball with DeAngelo Williams and rely on Ben Roethlisberger (319 of 469 for 3,938 yds 21 TDs/ 16 ints) and Antonio Brown. With age catching up to Adrian Peterson, Bell is arguably the best back in the NFL when he’s healthy and will be rounding into shape as the Steelers make their playoff push. The Baltimore Ravens and Cleveland Browns will definitely be on the outside looking in. The Ravens will have Terrell Suggs and Steve Smith to lead them into battle on both sides of the ball. However the Ravens struggle to run the football and Joe Flacco will be coming off of major knee surgery himself. Before his injury he was playing like the east coast version of Alex Smith and checking the ball down too much. Now with him possibly being gun-shy expect more of the same. One intriguing story to watch is the resurrection of Robert Griffin III and Terrelle Pryor in Cleveland. Head coach Hue Jackson has mentored a series of NFL quarterbacks to successful seasons. This could be a perfect storm of coaches and players all having something to prove and the ability to get it done. If Josh Gordon stays with the team, this could be fun to watch. It will come to fruition in 2017 not this year. However they will be a competitive team to watch offensively. Over the last two years the Cincinnati Bengals have charged into the NFL playoffs. It’s the first time they have gone in back to back years since 1982, the year after their appearance in Super Bowl XVI. In these recent years, they fell to the Houston Texans in the wildcard round of the playoffs. 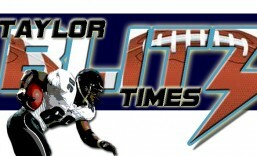 In 2011 they fell 31-10, however last year they lost a tightly contested contest 19-13. This year many pundits are calling the Houston Texans a Super Bowl favorite. If the Bengals have made strides to catch the Texans what does that make them?? Third year pro has led the Bengals to the playoffs in back to back years. Quarterback: Well coming off a sophomore slump is Andy Dal…wait…what sophomore slump?? Dalton is entering his third year where he improved on his rookie numbers in completion percentage (62.3% v. 58.1%), yards (3,669 v. 3,398) and touchdowns (28 v. 20). Now don’t forget he made the Pro Bowl as a rookie in 2011. Now that the Bengals have opened up the playbook further for a growing quarterback, he did suffer a few more interceptions (16 v. 13) and sacks (46 v. 24) than the year before. However the arc is going up on this kid at the exact same time the division is losing Raven Safety Ed Reed, and he’ll face 32 year old Safeties in Troy Palamalu along with a 34 year old Ryan Clark when he faces the Steelers. If their healthy. He has gained NFL playoff experience over these last two years and you have to ask yourself; Is this the year he can break through and win a playoff game?? He has to continue his maturation for this to happen. Last year he didn’t look good in the wild card loss to the Texans. He was 14 of 30 for only 127 yards and 1 interception. He was a little unnerved by the crowd noise in Houston. He was apprehensive in that game and had to live with that the whole off-season. He hasn’t missed a game in his brief career. At 6-2 215lbs, he is a big strong quarterback. He isn’t a threat to run like some of his contemporaries who have dazzled in The Pistol, however he did run for 4TDs last year. He isn’t afflicted by the Bengals losing ways of the past and has helped the team improve from 9-7 in 2011 to 10-6 in 2012. Only an injury seems to be all that could derail further development. Dalton is no fluke and gives the Bengals a fighting chance and ranks as a playoff caliber quarterback. Offensive Backfield: This is where the Bengals should use a draft pick in a couple of weeks. Last year the Bengals let go of Cedric Benson and former Patriot BenJarvus Green-Ellis ran for 1,097 yards and 6TDs. He is a steady but not spectacular player. Yet just like Benson, they keep grabbing running backs off the scrap heap. To take the next step they need to put a play maker at this position instead of a stop-gap performer. With all the SEC picks in the last few years, would they take Eddie Lacy out of Alabama? The time is now to plug in a viable rookie running back with Green-Ellis still in the fold. He’s only 27 and has a few years left in him. Bengals brass has also re-signed Cedric Peerman who had a better average than Green-Ellis (4.7 yard avg v. 3.9 yard avg) but there had to be a reason why they named Green-Ellis a starter over him. It couldn’t have been pass protection with the team giving up so many sacks. Cincinnati needs a runner not a ball carrier to push the envelope. The league average for yardage per rush is always around 4.0 and that’s all they can get with these players. With that in mind the Bengals can only be average at the position. Maybe Green-Ellis in his second year with the team can be that guy. We’ll wait and see. AJ Green is the best young receiver in the AFC, period. 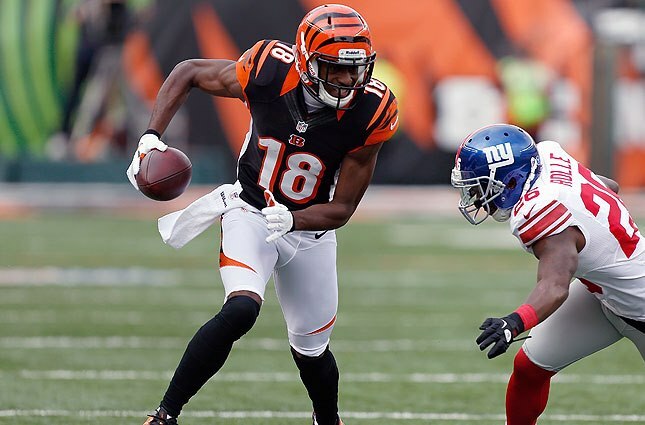 Receivers: The other component to the equation why the Bengals are rising to prominence has been the play of AJ Green and TE Jermaine Gresham. Both are coming off back to back Pro Bowl seasons even though they are so young. In only his second season, Green caught 97 passes for 1,350 yards and 11 touchdowns. Do you realize he caught 32 more passes than his rookie year? He improved in all statistical categories. The Bengals have to develop or draft a complement to him so teams, like the Texans in last year’s playoffs, can’t roll coverage to his side. Green has been able to blossom due to safeties having to pay attention to Gresham in the middle. At 6’5 261lbs, he is too much man for most safeties and linebackers struggle with his speed. He’s the AFC version of Vernon Davis just not as fast. Last year he had 64 receptions for 737 yards and 5 TDs. Career highs in catches and yardage. If the Bengals weren’t in so many spread formations, he would be a 1,000 yard performer. Do you realize he’s only going into his 4th season?? These two alone make the receiving corps. playoff caliber. Develop or draft another receiver and they will be Super Bowl quality. Offensive Line: This is another area where the Bengals should look on draft day to improve team fortunes. Last year the Bengals rushed for 1,745 yards and 11 TDs. Very middle of the pack numbers in terms of production. Keep in mind they allowed 46 sacks which ranked 26th in the league. Now is not the time for RT Andre Smith to play hardball in contract negotiations. If they lose him they may have to draft a tackle in the first round. When rushing to the strong side last year, the Bengals were thrown for losses 10 times. While in obvious power situations (3rd /4th and 2 or goal line) they converted on 76% of their attempts. All factors indicate he will re-sign. Left Tackle Andrew Whitworth just came off his first Pro Bowl and is going into his 8th season. Where he didn’t have to face a James Harrison in Pittsburgh last year, he’ll face division new comer Elvis Dumervil in Baltimore. Elvis did beat him for a sack in last year’s 31-23 loss to the Broncos. This will be his nemesis when they face the Ravens. However up the middle is where the running game is most solid and should improve with Guards Kevin Zeitler and Clint Boling who will be 23 and 24 respectively. This group needs to improve in their pass protection and right now they are just average. 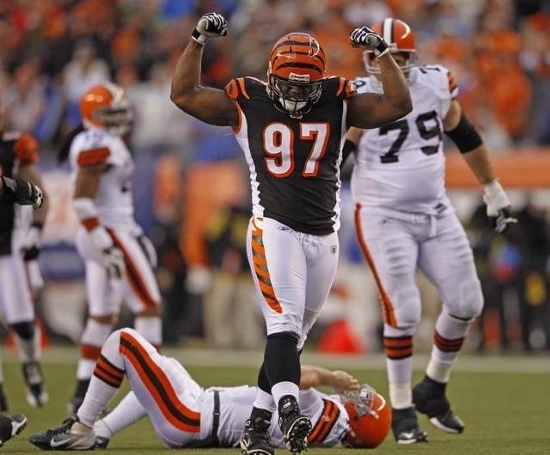 Geno Atkins leads the Bengals beastly pass rush. Defensive Line: One of the best defenses in the NFL is strongest right on the defensive front with DT/NT Geno Atkins and DE Michael Johnson. Atkins is only going into his fourth year and has been to the Pro Bowl two straight years. Last year he was 5th on the team in tackles with 54, had 12 1/2 sacks, and four forced fumbles while being voted All Pro. Johnson was right behind him with 52 tackles, 11 1/2 sacks as the team was 2nd in sacks with 52. Wallace Gilberry and Carlos Dunlap gave them 4 linemen with at least 6 sacks. This is a Super Bowl caliber group. Linebackers: The surprising play of free agent rookie Vontaze Burfict gave the team a faster look on defense than in years prior. In only 14 starts, he led the team with 127 total tackles and had 1 sack. Rey Maualuga was right behind him with 122 stops and another sack. They just need to force more turnovers by interception or fumbles to be a great group. If they can get a third blood thirsty linebacker behind that pass rush..watch out! Still a playoff caliber group with Manny Lawson still on board. Former Steeler James Harrison is close to a deal also. To add to the pass rush they already have?? Secondary: Did you know the Bengals were ranked 7th in the NFL against the pass and was 4th in passing touchdowns allowed with 16?? They were right there with Atlanta (14), Seattle (15), and Baltimore (15) respectively. You’ll note that one won the Super Bowl and the other two battled to make the NFC Championship Game. However this group hasn’t lost anyone like the Ravens losing Ed Reed or the Falcons losing CB Brent Grimes to the Dolphins. Defensive Co-Ordinator Mike Zimmer gets the most out of a hodge podge veteran laden group that doesn’t give up the big play. Leon Hall (37 tackles / 2 ints) is solid on one corner where they may need to look for Terrence Newman’s ( 73 tackles / 2 ints) replacement on the other side. He’s still playing well but will be 35 when the season starts. Adam “PacMan” Jones is there to lend support as is Nate Clements formerly of the Bills and Niners. Clements made the switch to safety for 9 games last season yet may have to mold a young safety if the Bengals can draft one. Another season like last year and Reggie Nelson will be in the Pro Bowl. He was 3rd on the team in tackles with 83, defensed 9 passes, and had 3 picks. This group is Super Bowl caliber based on their collective production. 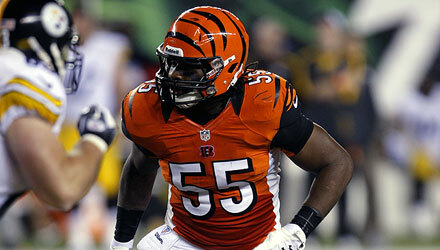 Vontaze Burfict is another reason the Bengals are going to make a move in 2013. Overview: This is as solid a team that the AFC has to offer. Their greatest asset this year is the continuity in coaches and player personnel. Then you look at the relative youth of all the key positions with Dalton, AJ Green, Vontaze Burfict, and Geno Atkins. Now The Chancellor has had his eye on this defense for some time now. https://taylorblitztimes.com/2011/11/01/week-8-afc-north-protecting-the-nfl-republic/ This team has an arc that is still going up. They were 7th in defense in 2011 and improved to 6th last year. This is no fluke. If you look at their division record, in 2011 it was 2-4 which improved to 3-3 in 2012. They finished 10-6 which was the identical record of the Super Bowl Champion Ravens. Yet look at all the upheaval of personnel in both Baltimore and Pittsburgh this offseason. Now think of the hole Elvis Dumervil left in the Broncos defense. Who has a better defense than this football team?? The Bengals can finally concentrate on luxuries in the draft without any obvious weaknesses. Having adjusted to playing near the league’s elite, this young team will crash the playoffs and might make it to Super Bowl XLVIII. Don’t forget the first cold weather Super Bowl had the Bengals in the 16th edition. They will at least make it to the AFC Championship Game. You heard it here first.